Interestingly, I am currently in Belgium, to present five years of specialized work with cellular agents, such as mammalian cells and bacteria. Cupriavidus metallidurans “and other metal-resistant members of the genus Ralstonia are frequently found in sediments and soils with a high content of heavy metals from diverse geographical locations.” [Ibid.] This naturally occurring soil microbe makes its home in inhospitable environments around the globe, particularly in soils contaminated with metal-processing chemicals and leftovers, such as gold mine tailings. My intention with this project has all along been to make a gesture, a ritual offering–as is within the nature of art and creativity–back to a poisoned site where settler industry has rendered a landscape useless and dangerous. This, with a professional, working scientific knowledge of the processes and field I am working in. My intention for a site inoculation ritual, whereby a small bundle of soil, wrapped in cloth and inoculated with live C. metallidurans, is buried in the toxic soil, is a potent gesture of several interrelated concepts: bio- (microbial) remediation, decolonization of land through bacterial re-colonization, reconcilation, and providing a critical space for dialogue around the acts of industrial mining, settler/indigenous relationships (to land and each other), language/culture/landscape and further human intervention. It has been brought to my attention that enough fear exists around the use of live bacteria onsite, that the merit of my project has been called into question, with the intention to subdue the intended activity. I am not surprised by this. One concern that has been expressed is around the threat of the bacteria functioning as an “invasive species” in the toxic landscape. 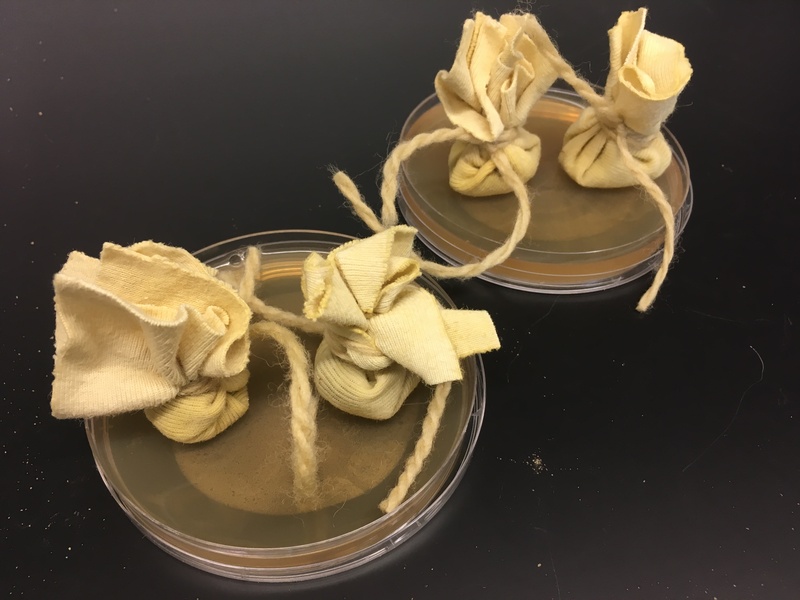 Naturally occurring soil bacteria cannot really function as an invasive species, nor is Cupriavidus metallidurans known to cause harm to any natural environment. Can they establish themselves in a soilscape where they weren’t already present? Maybe. But, the terminology of “invasive species” is not correct terminology to use here. Controls around the presence of bacteria are based on whether or not it is pathogenic, to humans and the wider environment. Cupriavidus metallidurans is nonpathogenic. In fact, “A strong resistance to environmental stressors and adaptation make it ideal strains for survival in decreasing biodiversity conditions and for bioaugmentation purposes in environmental applications.” [See more at this source] We can call it “probiotic” for a contaminated (deadened) landscape, to borrow an applicable term from the human relationship to bacteria use. Soil inoculation is a widely practiced technique, specific to agriculture. Again, this is performed as a probiotic measure, where bacteria that support nitrogen uptake in the desired crop is coated onto seeds and spread/planted over large tracts of land. It is considered a fertilization method. Permits required for such large-scale operations are granted based on an assessment of risk (again, based on pathogenicity). The level of risk must be minimal. It is important to make a distinction between “minimal” and “zero” because there is never zero risk. There is only, at best, minimal risk. It is highly possible that C. metallidurans could even already be present in some of the Nova Scotia gold mine tailings, but there is no way to know that without sending samples away to a lab that can perform genetic sequencing on each bacteria species present, at a very high cost. But this is in fact unnecessary, to both the science of the project and the artistic gesture, because it is irrelevant. Inoculating a toxic waste site with a small bundle of live C. metallidurans falls within the minimal risk category, not only due to its nonpathogenic categorization but also due to the scale of the intervention. In fact, there is such minimal risk as to be likely to have total failure to thrive. This has been my knowledge all along, and its failure to thrive is one of the most important aspects of my intervention – in fact, the whole point. A futile gesture at restoring the earth and its resources, post-colonial destruction. This brings me to my second point: deep geological time. Anthropocentric notions of time are often based on capitalism, within the lifespan of a generation or two–predominantly, efficiency models that have at their core, resource extraction and production. Many indigenous cultures, however, engage in very different understandings of time–concepts of the ancient, rooted in oral culture, creation mythologies and a polychronic unfolding, meaning multiple synonymous time-spaces–stories spanning great eons of existence, where all natural elements have entity-hood, or spirit. We can contextualize this scientifically (if we must) within the frameworks of geological time–the slowness of tectonic plate shifting, of mineral formation, of deep terra-forming that eventually births human culture amongst other beings that we share this third-dimensionality with. The idea of the Anthropocene is that geological time is disrupted by human intervention. Industrial activities leading to climate change, for example. There is in fact no return from our mass-scale interventions. My gesture of adding live inoculant to the soil of a damaged planet in a futile attempt at remedying the great chaos of the Anthropocene, from the single-person perspective, is also an attempt to reconsider geological time. What if one bacterium thrives? How long would it take to reprocess/ detoxify the entire expanse of the Montague tailings, for example, starting from a single cell? Possibly thousands of years, maybe ten thousand. This is my underlying hope, that this flip-side of human intervention might expand beyond my lifetime, beyond what can ever be known by my era of humans, because then it is protected from being co-opted by humans for human profit. It becomes myth, an improbability, and it becomes a trace of an artistic gesture meant to remediate much, much more than the surface of a Nova Scotia landscar. Given the external questioning/ resistance I am facing in carrying out my artwork, how then will I maintain the artistic integrity of my gesture? That remains to be seen, but what is ironic is that by simply walking around Belgium, where I am now, and returning from overseas and then walking around Montague, I may very well inoculate the soil with precisely this bacterium, simply from carrying it home on the bottom of my boot.